Thank you to our 2017 RAF Contributors! 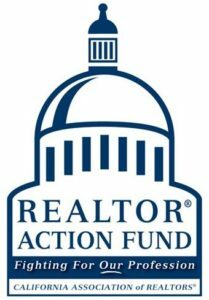 The REALTOR® Action Fund (RAF) helps to protect private property rights, homeownership, and YOUR business. With potential tax reform in Congress that would increase the taxes on homeowners nationally at an average $815 annually, it is now more important than ever to contribute to the RAF. We have successfully fought back against taxes on your commission and unnecessary fees on home buyers because of the efforts of our members. On behalf of the Board of Directors, we are recognizing those members and giving a very special thank you for their 2017 voluntary contributions to the REALTOR® Action Fund. $5,000 initially and $2,000 annually- $449 Annual Renewal for Chartered NAR Golden “R’s” prior to 01.01.02. NAR provides annual pin, invitation to attend NAR’s special functions during NAR meetings. C.A.R. provides a major donor ribbon given and an invitation to all C.A.R.’s major donor receptions held during the C.A.R. Directors meetings. $2,500 initially and $1,500 annually- NAR provides annual pin, invitation to attend NAR’s special functions during NAR meetings. C.A.R. provides a major donor ribbon given and an invitation to all C.A.R.’s major donor receptions held during the C.A.R. Directors meetings. $1,000 Initial Contribution and $1,000 Annually-NAR Sterling “R” pin given by NAR upon initial investment, invitation from NAR to attend their special functions during NAR meetings. Members will receive a major donor ribbon, along with an invitation to all C.A.R. major donor receptions. $148 and above Annual Contribution – Members will receive a silver RAF pin upon initial contribution and an invitation to the Capitol Reception during the Sacramento mid-year meetings.